Back in the land of snow and abundant internet access... some photos are up (encountering this beautiful and friendly elephant was one my favourite moments in India). Stories will follow as soon as I get through exams this week. Stay warm and enjoy London FW! We miss you Adeleine! Good luck with your tests! Yeah, as a dedicated lurker on your site (I've only recently started my own) I'm very happy you are back and look forward to new posts. Good Luck with exams. 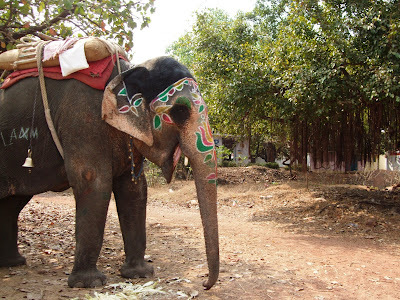 Charming Rajasthani elephant...looks fun to ride. What a pleasure to see you're "back". c.j.b. : Thanks- love your glove post. bobble bee: Gracias, I so appreciate that. How excellent, a trip to India! enjoy it and keep on writing. We are planning a return for The Style Scout, but for now, I am updating the Hazelnut blog. the elephant is really beautiful! hazelnut: Fantastic, I look forward to your updates (and happy birthday!). stiletto: Yes, she was lovely.